Pic no1 – On horseback. Rebeka, 19, is not like the other young ladies of her generation. She doesn’t really care for fashionable trends, she prefers jeans and boots, sporty and comfortable clothes. At school, even in wintertime, she would usually wear a plain T-shirt and a big smile on her face telling you that “It is not cold at all!”. You would hardly ever see her sitting alone pushing the buttons of her mobile or browsing through one of the ever-popular SN sites. She lives in Nőtincs, a lovely village hidden up in the Naszály Mountain in North-Hungary, and she is a true nature-lover. She likes spending all her free time out in the fields with her horses and her huge dog, Happy; or in the yard with her sheep, goats and rabbits. Pic no2 – Rebeka with Happy. 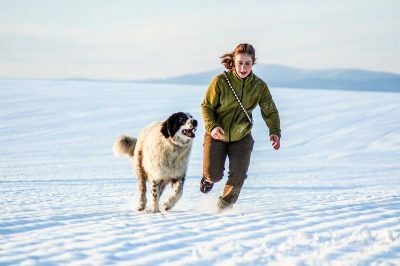 Rebeka is on the home straight of her Green VET studies and she is going to graduate this June at the EUROPEA school FM KASZK Vácimező completing the course in Animal Husbandry and Animal Health Care (EQF:5). Her love of animals took her all the way to the UK last summer. With the help of our EUROPEA colleagues from the Easton & Otley College, Norwich, she did a three-week practical training on a farm with Red Poll Cattle and Texel sheep (the breed she too keeps at home). She got back home with excellent references. 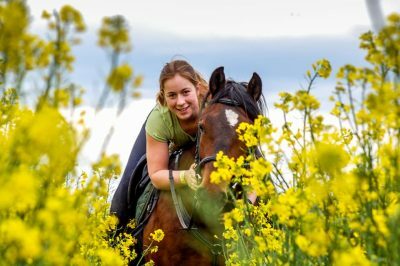 Her plan for the next academic year is to continue her studies at the SZIE University in Gödöllő, which is the most prestigious agricultural higher educational institution in Hungary. She applied for a place in the international class of Agricultural Studies and she is determined to do it in English (! ).